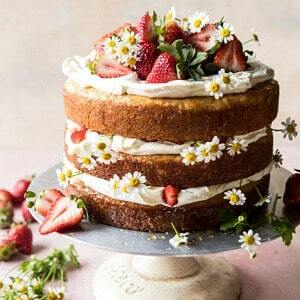 Strawberry Chamomile Naked Cake…because it’s SPRING! Or it will be on Tuesday, so close enough. 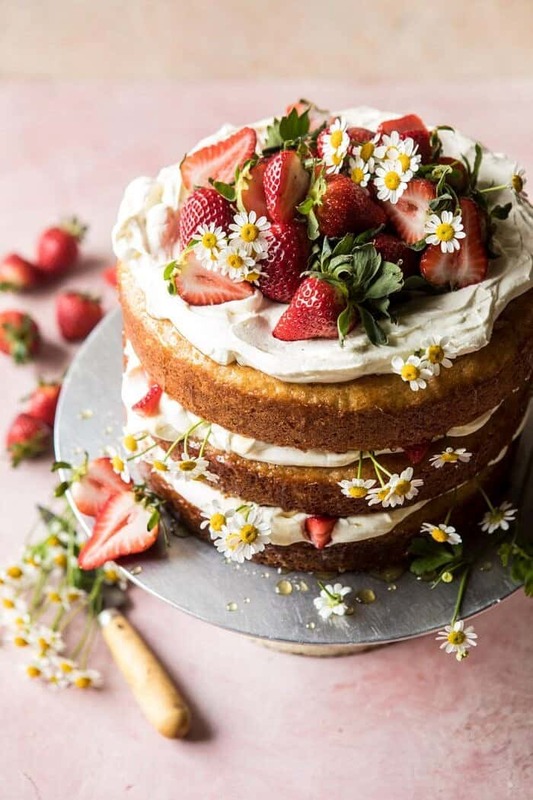 And Yes, I know that a lot of you are still covered in snow right now, but I think this cake will bring on the spring vibes, and in turn the weather will play along. It’s all about positive thinking, right? Also, happiest FRIDAY!! I am very excited the weekend is here, and hoping for a little bit of down time after a busy week. We have been working endlessly over here on multiple projects, the biggest one being the studio barn. There has been lots of decision making and hair pulling, so I know everyone over here is ready for a bit of a reset. We probably will not get it, but hey, it’s all going to be worth it in the long run! 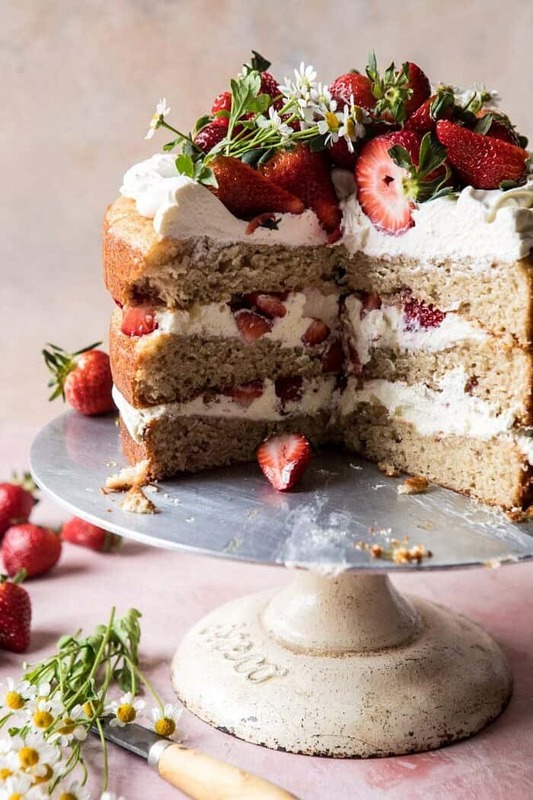 Thankfully, a lot of my “hard” work and days spent in the kitchen this week resulted in a few beautiful creations, like this strawberry cake that makes ending the work day, extra, extra sweet. 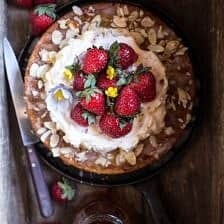 With spring on its way and Easter coming up in less than two weeks, I knew I needed to share this strawberry chamomile cake that I’ve literally been thinking about since December. I’ve said this before, but sometimes I get ideas in my head months and months before I actually create them. Sharing a strawberry cake in December really does not make sense, so I waited and waited and finally the time has come. For one, it’s covered in chamomile flowers, which you all know I am obsessed with. I made this cake with Easter in mind, but it’s obviously great for any and all spring (and summer) occasions. Mother’s Day, a spring brunch, or just a simple weekend treat. It’s pretty easy to make, and I love that it’s a naked cake, as opposed to a cake covered completely in frosting. Naked cake means easy, peasy, and doesn’t require any fancy decorating or really any decorating skills at all. Layer everything up, add strawberries, and done. The cake base is my favorite vanilla cake with sweet strawberry jam swirled throughout. It’s simple, but really delish. 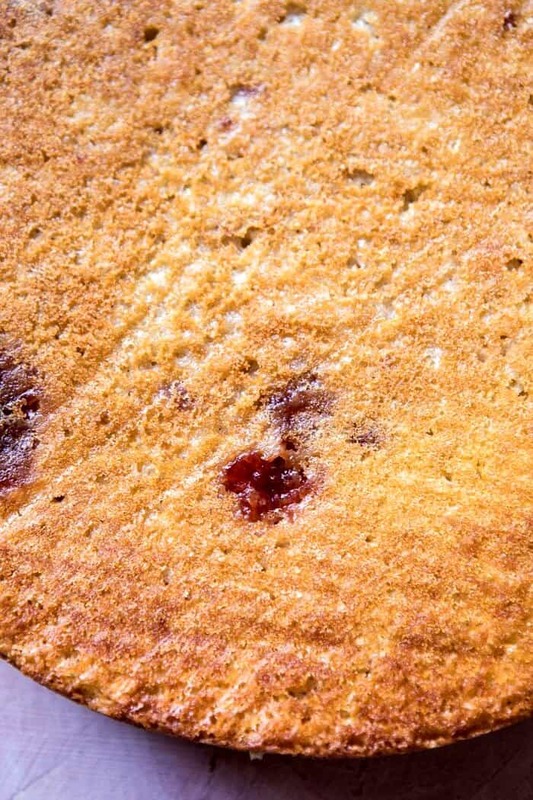 I used a strawberry jam instead of fresh berries in the cake because I found that using jam was easier. The jam actually resulted in a better strawberry flavor, and baked up prettier than using fresh berries in the cake. For the topping, originally I was planning on doing a frosting, but during my second attempt at the cake I realized that a lighter topping would compliment the cake much better, so I made a chamomile cream to slather all over cake layers. I love that the cream is hinted with the warm tones of chamomile tea and has just the right amount of sweet. It’s perfect topped with plenty of fresh strawberries. SO, what do you think? Is this your new Easter cake? Are you going to make it next week to celebrate the start of spring? Or maybe save it for Mother’s Day? Whatever you decide, just be sure to make this cake. 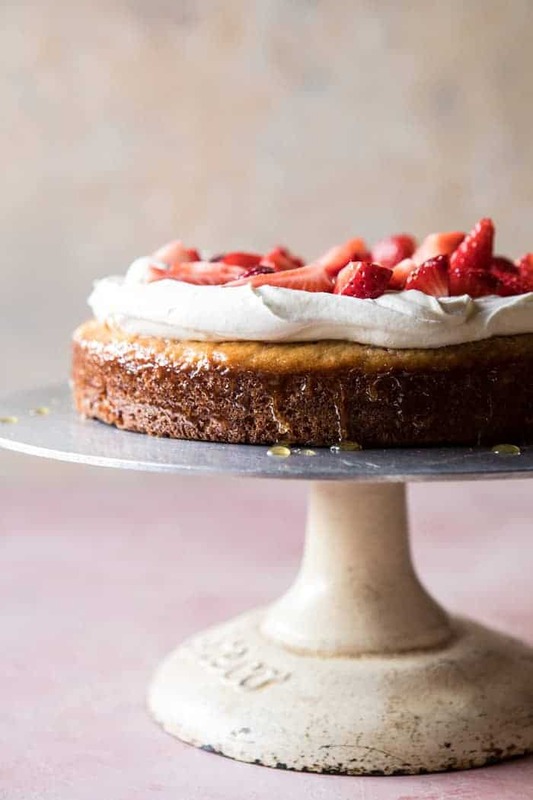 The sooner the better, because as soon as you make it this cake will be come your new go-to fruity dessert. 4. To make the chamomile cream. Add 1 cup cream to a small saucepan and bring to a simmer, but do not boil, simmer 1 minute and remove from the heat. Add the tea bags, cover and steep for 5-10 minutes. Remove the tea bag and place the cream in the fridge to chill completely. Next, beat the cream cheese in a stand mixer until fluffy, add the chilled chamomile cream and remaining 1 cup cream and whip until stiff peaks form. Stir in the powdered sugar. Keep stored in the fridge. 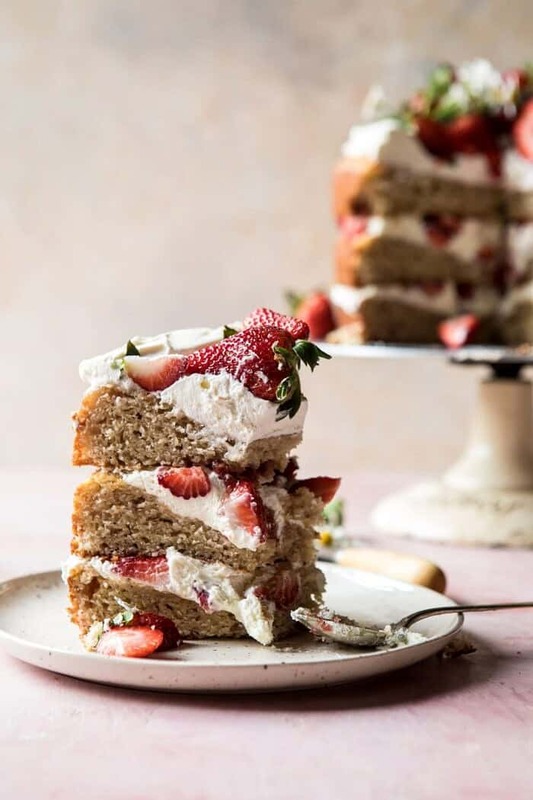 Layers and layers of spring strawberry perfection. I love, love, love the pictures and I love the idea of infusing whipping cream with chamomile. Also, I am not a big fan of American buttercream, it is too sweet for me so this sounds perfect for spring! Thanks for sharing! I am sure you will like this then, Jenny! Thank you! what a beautiful, beautiful, beautiful cake. Please send it over. Your photography is always so beautiful…..a feast for the eyes! And where did you find that awesome cake stand?? Also, and belatedly, your parents must be amazing people if you and Red are any example! THANK YOU! The cake stand is a vintage find of my dads. I love it! This looks VERY tasty. So pretty too. What a beautiful cake! I’ve had fun making cakes lately even if they are a little more labor intensive. Pinned for making this month! Happy Friday! Great! Thank you so much Patricia! You hit this one out of the ballpark, Tieghan!! 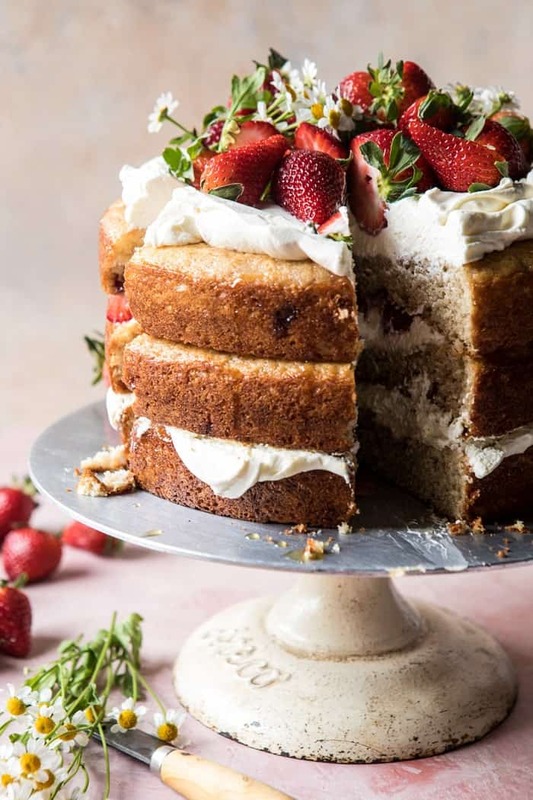 I love all things strawberry and I am not a huge fan of frosting, so naked cakes have become a favorite (to look at and eat!). My hubby has been asking me what kind of birthday cake I want this year, and I think this is it!! Can’t wait to see this on my table in just a few short weeks!! Oh and that cake stand – please tell me it is something I could order – I have been searching high and low for one like this!! YES! I hope you love this cake and it turns out amazing for you on your birthday! Thank you so much Leah! Absolutely gorgeous cake. And I’m obsessed with flowers too. I just think they brighten up everything. I love the simplicity of it and the fruit. 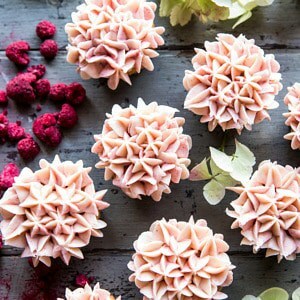 I’m pinning and sharing — Your shot of the cake is amazing. I completely agree! It makes it feel more like Spring! Thank you Marisa! This looks amazing. Definitely making this for both Easter celebrations I am going to! 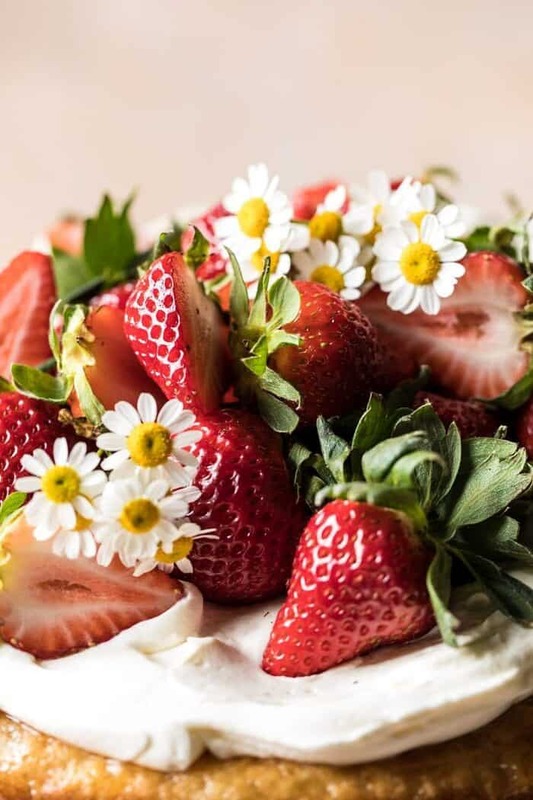 Strawberry cake with fresh strawberries and the chamomile cream….mmmmm. The pictures are making my mouth water, the flowers in the pictures accent the cake very nicely! Your recipes never disappoint, I have yet to make a recipe of yours that I don’t like. Thanks for all the great meals and keep them coming! Thank you Joshua! I hope you love this cake and other recipes on my blog! Oh yes, still tons of snow in Cleveland; but hooray for this “screams springtime” cake! Gorgeous creation – your hard work always shines through. Awh man! Hoping for some warm weather for you guys soon! Thank you Liz! Girl you continue to create masterpieces! Such a beautiful cake & I imagine it tastes amazing too! are the flowers a garnish only, or are they edible? Hi Amanda! I use edible flowers for my cakes, so it is up to you! Thanks! This cake is dreamy. Such beautiful photos! I’m sure I’d love the flavors too. Have a great weekend! Thank you Natasha! I hope you have a great weekend as well! 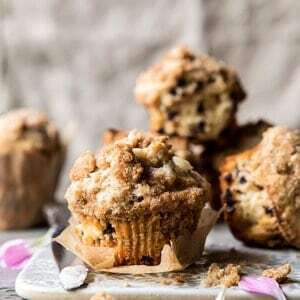 Your recipes are so unique and look so delicious. 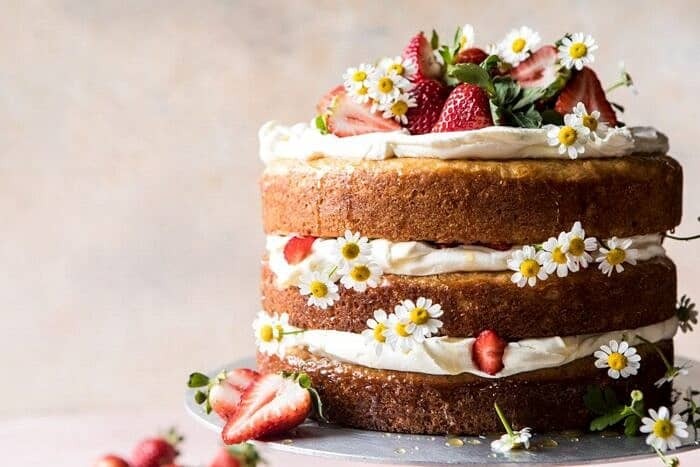 This is an interesting looking cake and I love how you decorated with chamomile flowers. This cake is too pretty to cute into!!! Do you grow your own edible flowers? I just looked at your recipe for the banana cake with the chocolate frosting! Looks delicious! I forward a lot of your recipes to my son in Colorado. He loves to cook and bake. Hi Sandi! I am so glad you like this cake! I do now grow my own edible flowers, but I hope to someday! Thank you so much! LOVE that chamomile cream! This looks incredible Tieghan! So perfect for spring! I hope the barn is going well and you’re able to rest this weekend. Maybe a nice Sunday brunch with this cake would be nice. I hope you’re staying warm and I’m looking forward to this weekends post! Hi Kristin! I am so glad you like this cake, thank you! It would be so perfect for Mother’s Day! I will link the edible flowers down below! Can you make the frosting without the chamomile tea? Beautiful cake. Love the way you frosted it! This cake looks so gorgeous!! I will definitely be making this soon! love love it! 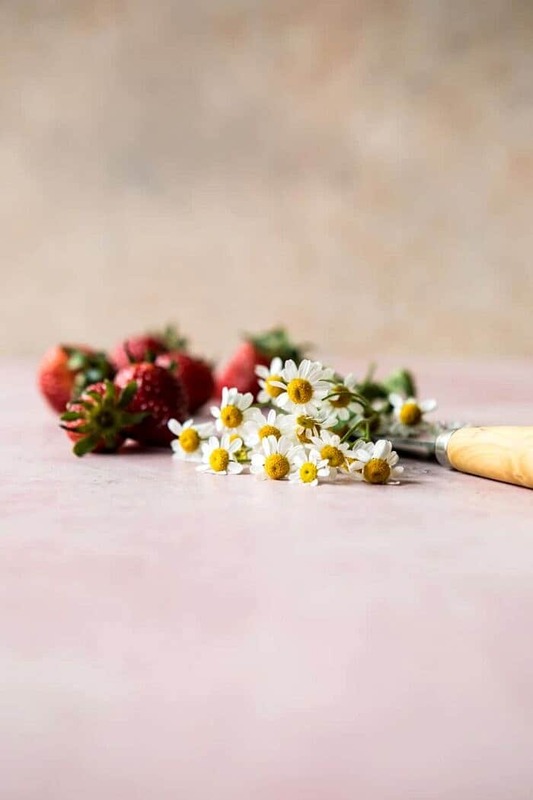 Where did you find fresh camomile flowers this time of year? I love how this loohs–really lovely. Would be great for Easter! Thanks. Hi Ellen! I order my edible flowers online! I am so glad you like this cake! I love this cake so much! It’s so fun to look at, too! This is definitely one of your most beautiful creations. Amazing. They look similar. I guess we both had the same cake idea! I hope you love this one as well! Wow what a gorgeous cake!! Perfect for the welcoming of springtime! Quick and very stupid question, how much of a difference on baking time if I were to use 9in pans? Hi Lauren! I will put the link down below. I hope this helps and let me know if you have any other questions! Where do you find the pretty little flowers? Hi Katie! I buy my edible flowers online! 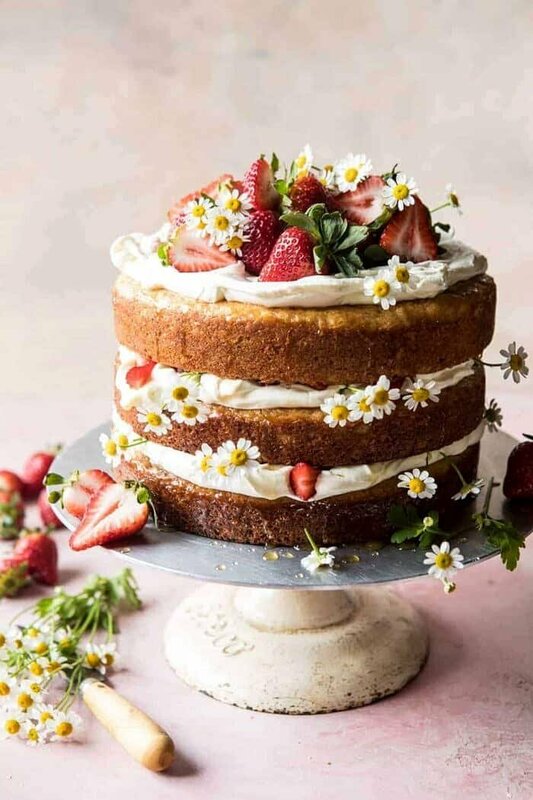 This cake is beyond gorgeous – happy spring!! Thank you so much Laura! I am so happy you like this! This is such a BEAUTIFUL cake! It looks perfect for spring too. Sadly i can’t have it. 🙁 I have a gluten intolerance. Do you have a gluten free version? It took me months to figure out that that was my problem but after alot of research and reading we narrowed it down. ( http://bit.ly/2DLgnbz ) If not that is okay, I can still have the icing! Yum! Do you think this could be modified to be a sheet cake? Any suggestions to do so? Thanks! Now this is just dreamy. Those pictures and that CREAMY GOODNESS!!!! I Want spring and I want it now! ME TOO! Thank you so much Lucy, I am so glad you like this! 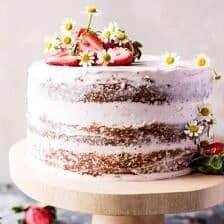 Has anyone used cake flour or should I just use regular? Hi! I can’t get my frosting to whip into stiff peaks. After trying to get it to in my stand mixer without success I popped it in the fridge in hopes that chilling it colder would help but it didn’t. Is it possible I overmixed it and stiff peaks are now unable to form? Should I start over? Hello Tieghan, this was the highlight of our Eater table!!! Not as beautiful as yours but everyone loved it (I used cream cheese and quark for the frosting with no chamomile because I am not found of chamomile). It was sooo goooooood. Thank you for the recipe. I am sure it looked amazing Maria! Thank you! I am so glad you enjoyed this! This recipe is on another level! I made it for my friend’s birthday and everybody was OBSESSED. 🙂 I will definitely be keeping it in my spring/summer cake rotation. It is BEAUTIFUL. I decorating with blueberries, strawberries, and edible flowers. I REALLY want to try this recipe! It’s so delightfully springy! Do you think I could make this as cupcakes? Are there any variations you would recommend if I tried doing that? I live the recipes you have on the site and can’t wait to try this one. I do have one question. If I choose to make two lates only, do I just apply 2/3 to all of the ingredients? (I apologize if the question is rudimentary…I’m a novice cook). Hi Erin! I do not grow my own edible flowers, I order them online. I’ll link it below! I hope you love this cake! Tieghan – you can ignore my previous question about the flowers….I found your replies and a link to the website when I started from the bottom of all the great comments! Thanks again! Can’t wait to make this! I can’t wait to try this recipe. 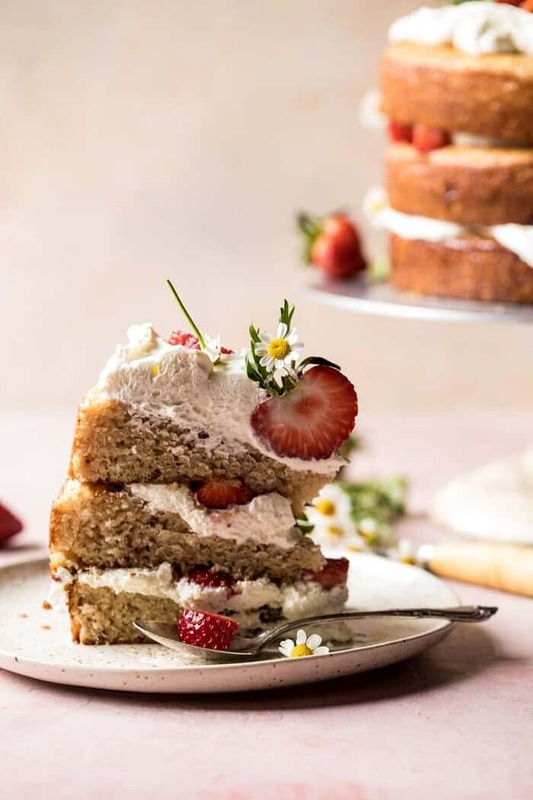 It is such a beautiful cake and the recipe sounds delicious! Thank you so much Heather! I am so glad you loved this! This cake looks so amazing!! I’m going to bake it for a friend’s birthday in June. One quick question, I’m not a huge fan of canola oil, can I use butter instead? Thanks! I made this cake over the weekend for a bbq. Everyone loved it ! It looked beautiful! I didn’t have fresh flowers but I had some dried camomile flowers and they looked great. It tastes super yummy – go make it ! Everyone said it was super delicious! Will make it again for sure – thanks Taegan ! Thank you Jane! I am so glad you loved this cake! Hi! This cake looks beautiful and delicious! I would like to make it for my daughter’s birthday but I have a lot of people to feed (18 adults and 6 kids). I’m thinking of making it in an 18 inch wedding cake pan and slicing it in half. Any advice on the proportions? Should I double it? What about cook time? I made this cake and it was delicious and so fun to make! The frosting is the perfect flavor, not too sweet and very fluffy. soooo good! Hi Tieghan, I am absolutely in love with this cake, it looks so fresh and beautiful. I decided to make it for tomorrow’s 4th of July Celebration, and I already bakes the 3 cake layers. I am a real beginner in the kitchen and I like to plan ahead, can I also make the cream a day in advance? This looks so beautiful and delicious! Where can you purchase the flowers? Are yours edible? Hi Sandy! Mine are edible and I will leave the link of the website down below! Would this work for cupcakes…use the same batter for cupcakes, the frosting on top, and add a strawberry on top? Hi There – I love this cake! I made the strawberry cake with vanilla buttercream for my sons birthday in April. My daughter now wants it for her birthday party next weekend, but I have recently been diagnosed with Celiac :(. Do you know if this might translate to Gluten Free with a one-for-one GF flour mix (Ie Bob’s red mill). And insight you can give is appreciated! Hi. Making this today!!! I would like to know if I can make this cake ahead of time? Or if the icing will make the cake soggy? This cake was my introduction to your blog last week, and I have to say it was one of the best cakes I’ve ever made! It was beautifully balanced and unfussy. So glad I stumbled onto it. Can I use a long cake pan 13×9, instead of the 3 layers? I prepared this cake yesterday to celebrate the first day of Spring. It was easy to prepare and was absolutely delicious. THIS IS ONE GORGEOUS CAKE!!!! I made a few minor modifications- cake flour instead of all purpose, I decreased the salt to 3/4 tsp and instead of the chamomile tea infusion I added almond extract. I also increased the powdered sugar by 1/4 cup. I can’t wait to make it again and this time I will try infusing the cream with chamomile tea as written. My cream frosting “curdled” when I added the powdered sugar. Do you know what would have caused that? Hey Carly, Did the cream boil at any point? That is the only think I can think that would have made the cream curdle. Hope the cake still turned out for you! I made this cake on the weekend and it is gloriously good! The cake part is perfect. I struggled with the cream. I made a first batch and when I added the tea infused cream my cream lost it’s stiffness and peaks. It had no structure. I got more cream and tried again. Same thing. I had no choice but to assemble it because it was my daughter’s birthday cake. It looked less than pretty but it did taste amazing. I only layered two bc all the cream just ran out all over the place. Would love to hear advice on this bc the taste was incredible. Hi! I have been searching for the edible chamomile flowers but I cannot find them. Where do you get your flowers from? Made this cake for my Mom’s Birthday, and not only was it good, but it also was a showstopper. Never made a cake with canola oil, who knew. It was delish, and I enjoyed making it. It made me happy. Thank you for this, i’de definitely make this cake again and soon! HI, I LOVE the look and sound of this cake and want to make it exactly as you did. However, I cannot find edible Chamomile flowers. Any ideas on where I can buy these from? Hi! This looks so good and I’m hoping to make it for my mom’s birthday. My cake pan is 8.5″ in diameter, rather than 8″. Can I still bake at it the same temperature but just for a slightly shorter cooking time? Can I leave the jam out?? How will this effect the cake? I was think of making the cake with a hint of lemon instead? This cake looks amazing and I have made it for Easter tomorrow along to celebrate my mom’s 70th birthday. I found that my icing did not look as thick as yours and it seemed to be more temperamental, but overall, I don’t think my guests will notice. This cake looks amazing and I just made it for Easter and for my mom’s 70th birthday. I can’t wait to try it out. The taste of the frosting was not overwhelming with tea flavoring. Although, my icing did not come out as thick as your picture. I am not sure my guests will notice. Can’t wait to dive into the cake tomorrow! 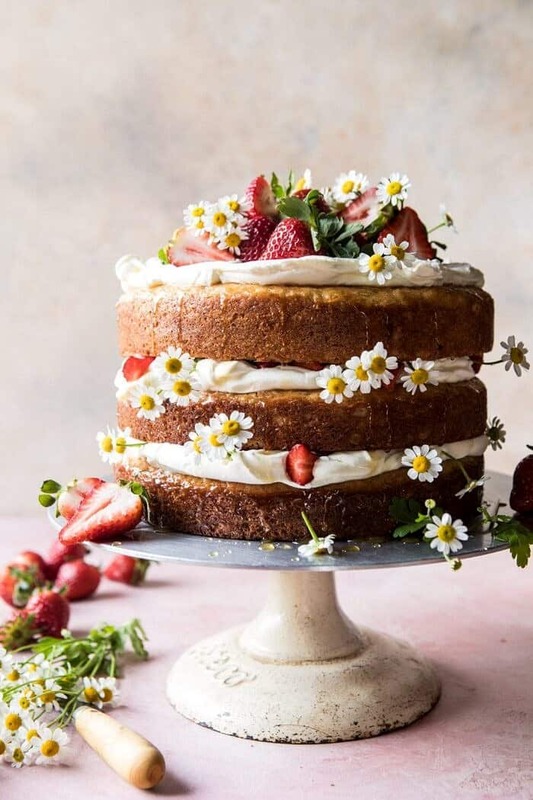 I’d like to make this gorgeous cake, but the problem is: we really don’t like chamomile tea. Do you really taste it? And if yes, do you know a replacement?